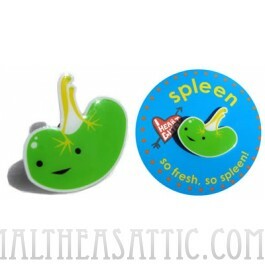 Give thanks to the wonderful spleen, which fights infection and cleans your blood while you sleep. Thanks, spleeny! This cute little pin is 1.25" & comes packed on a card. You're reviewing: Spleen Lapel Pin - Smells Like Spleen Spirit!